I was an avid reader as a child and had a good collections of the usual Anne of Green Gables, Trixie Blenton and Nancy Drew. 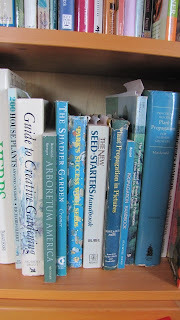 As I got older, I collected books on crafting and sewing. I still have many of those. 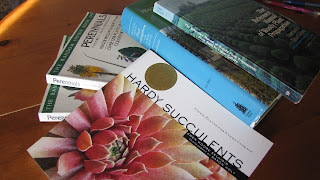 As I became interested in gardening, so to added to my collection of books. Cooking; dido. A few years ago I said enough is enough, to a point. Out went my collection of novels, and I became an avid admirer of our local library for those types of books. I found I read them once and did not wish to read them again, and if I did, I knew where to find them. But my garden and cook books (I did weed through those) remained. I am very particular lately in the books I purchase as of late. No Cole's books for me. I want to learn something. I like reference books, ie... Perennials (Phillips and Rix), The Reference Manual of Woody Plant Propagation (Dirr), Hardy Succulents (Kelaidis)... and the list goes on. 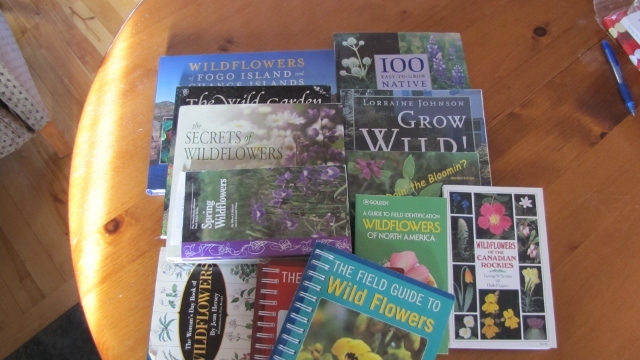 As you see, I have an extensive collection of wildflower books. Andrew usually gets me a gardening or cooking magazine for my stocking. 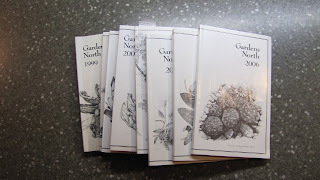 Lately it usually has been cooking, but this year he got me the BHG Country Gardens fall 2012 issue. 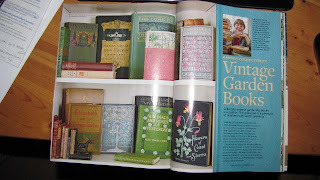 As I was flipping through it (he picked this one because it had a section on rock gardens), here was an article on Vintage Garden Books. 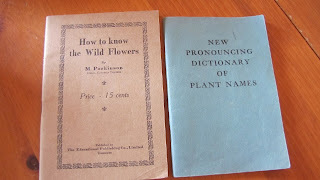 Years ago, I started to collect old garden books (and cook books), particularly old garden reference books. This little group probably started it off, "How to Know the Wild Flowers" by the Educational Publishing Co. 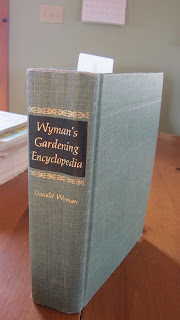 Printed in 1905, it is in great condition. I think it came from my father-in-law's collection of government publications. 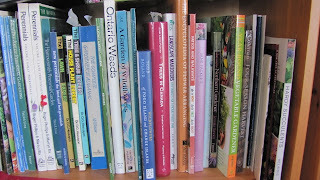 I went through his collection he brought with him when he retired from working for the Nova Scotia Department of Agriculture as a Horticultural Technician. 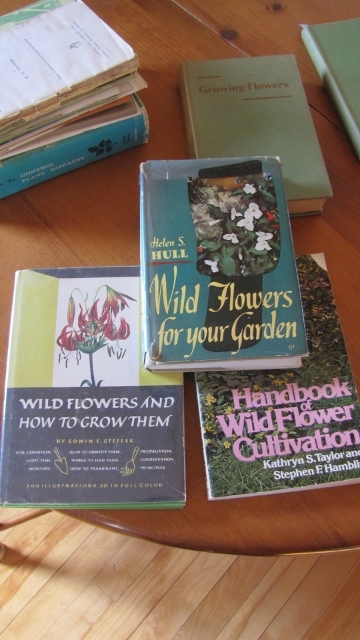 His job was to oversee the Alumni Gardens at the Agricultural College and to dispense advice to anyone who called (a former 'Marjory Willison or Master Gardener). Try finding anyone there to do that now. Then I started to pick up old reference, gardening books when I saw them, I guess I seem to have been particularly interested in wildflower books. 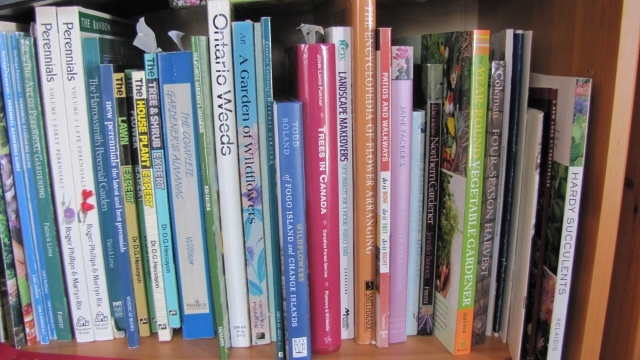 But I also picked up disease and insect injury books. 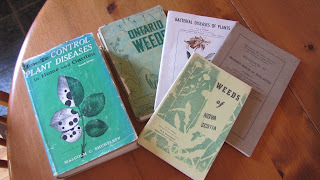 There methods of eradicating and treating the problems may be out dated (lots of chemical solutions) but they at least help identify the problems of particular plants; then with the identity solved; a quick check either on line or another book, the problem can (not always) be solved. Garden's North no longer prints a catalog; a shame, because they are a valuable reference. I am constantly going back to them. Now when I purchase seed, I cut and paste the descriptions to my computer for future reference. 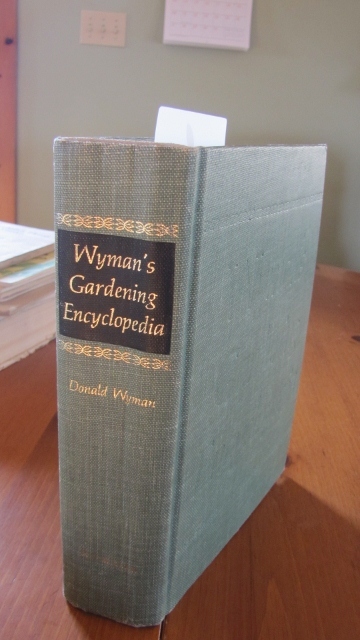 This is one of my favourites, Wyman's Gardening Encyclopedia. It has everything (almost). Andrew's Dad has a copy and I used to flip through it all the time. I found my own at a local antique shop for $20. No hesitation. I use it all the time. 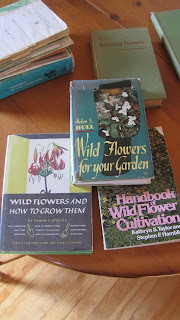 He still has some older books I covet (maybe I'll inherit them).